We know that ivermectin can be very dangerous to certain breeds of dogs. Ivermectin prevents or kills parasites by causing neurological damage to the parasite, resulting in paralysis and death for the parasite. Dogs genetically sensitive to the medication have an anomaly that allows the ivermectin to pass the dog’s blood-brain barrier and into its central nervous system, which can be lethal for the animal. My American Pit Bull Terrier is at University of Florida Veterinarian School of Medicine right now being treated for Ivermectin poisoning. He had a sudden attack while on our walk. Signs were 1st slobbering/drooling (excessively) then diarrhea. I arrived at an animal clinic within 20 min where he then began vomiting and having seizures. Blood work showed elevation in Liver and Pancreas reading was 1256 He was given fluids and treated for what the Dr suspected was heat stroke after 6 hrs the Dr gave him Vit K injection. I then transferred him to Emergency Hospital for over night care where he was given more fluids and I was informed his temperature had risen significantly and at about 6am he was given charcoal. In the morning the Dr. recommended University of Florida. So I left immediately for UF. He had been on his side laid out flat for about 20 hours and when i put him in my car I noticed he wagged his tail slightly. During the drive he did raise his head in an effort to be upright! Upon arrival at UF his heart rate was critical. Meds to stabilizes heart/monitored catheter and IV fluids. Next day prognosis Ivermectin poisoning via ingesting Daily Feed Through Wormer in horse manure and or ingesting left over grain/wormer in stalls at night!!! I had NO IDEA the horse manure could be toxic. I remove feces from pastures everyday and of course the dogs ride in 4wheeler with me and once in a while I would catch them eating the manure. Its been 6 days now his organs show NO damage. He’s been taken off all support. He is eating and drinking and can stand to urinate. He can walk briefly then he starts to have tremors/shaking and wants to sit down. I’m hoping since everything has progressed for the better that eventually his Central Nervous System will recover enough so that he can have a normal life. Going to visit him today and possibly bring him home. I know that I’ll have to provide a lot of physical therapy so if anyone has any ideas I would great appreciate them. Sorry to be so long winded but I hope through my experience another dog will not suffer and will have a chance to survive. Please tell anyone you know that has horses and uses daily wormers that the manure is toxic! BTW the UF was absolutely wonderful!!! They let me stay in the Critical Care unit in the cage with my dog anytime I wanted. I was there off and on for 4 days and I never saw anything other than wonderful caring DR.s, students and techs!!! God Bless them all. Thanks to Cindy in Florida for sharing her story! And thanks to the folks at the University of Florida Critical Care Unit! You rock! So here’s the deal per Chris Bern, DVM: “The amount of ivermectin found in [horse] manure has actually been studied. It’s a pretty low concentration, so a dog has to eat a fair amount to become toxic, but it can happen. The half-life of ivermectin in horse and cow feces has been measured at as low as 11 hours and as long as 9 days. That means that it can take up to 9 days for half of the ivermectin to become inactivated, then up to another 9 days for half of the remaining amount, and so on. Realistically you can have measurable ivermectin in the manure for 1-2 weeks. He concludes his comments with this: Don’t let your dog eat livestock manure. If they are not being fed any drugs, there should not be a problem with drug interactions, however they could be at risk for any parasites in the horses’ poop. So you may want to deworm your dog(s) regularly. Some people here have recommended diatomaceous earth or other natural dewormers as safer alternatives to ivermectin and other chemical dewormers. They might be safer, but every study ever done has shown them to be essentially useless in parasite control. People who say “I’ve been using it forever and my horses do great” probably don’t have horses that are especially affected by parasites. Wild horses, for example develop a degree of natural immunity to parasites if they are healthy. They will likely always have some, but not enough to affect them negatively. The people who have “success” with natural dewormers likely simply have horses that have developed a similar natural tolerance/immunity. There is nothing wrong with that, but they are mistaken if they think their natural dewormers are actually doing the trick. I have horses all around me. I’m on five acres. There is one horse beside me, and across the street she has over five. This women has been told by me that I personally have allergies that are bad, to horse urine. There are horses every where out here, but she is the only one I know that spreads her urine and manure, right in front of my house across street, on county property. Now I’m learning it’s not only me she is disrespecting, it could affect my dog? I’m in Fl. Osceola county, and can’t find anyone to make her stop spreading, every Wednesday. Any suggestions would be appreciated. Have been dealing with this issue for over five years. Hopefully you will keep your dog on your side of the street and away from her manure. Does she not have much property? Is that why she spreads her manure out in front of her property? If that is county property, have you contacted them for input? Is there anyone that recycles manure for maybe farming fertilizer? I was thinking that if you could find someone who would take her manure and maybe recycle it so that they would profit from it, then she wouldn’t have the need to spread it out in front of your house. Maybe you can post an ad in your local newspaper asking if anyone would like free horse manure and see if you can find someone who would take it away without charging her for doing so. I would imagine that a horse begins to eliminate the ivermectin within a day. One study on the effects of ivermectin in the environment found that the loss of ivermectin residues from an Iowa clay loam soil ranges from 1 to 2 weeks in summer temperatures and up to 52 weeks in winter temperatures. Composting involves heat, so after a couple weeks, it will be less toxic than fresher manure. If you have one of the breeds that can be sensitive to ivermectin, immodium and some anti cancer drugs. The University of Washington does an MDR1 test that you do at home with a kit they send you. You just brush their gums per the instructions, send it back and in a few weeks they email you the results. My Australian Sheperd came back mutant/normal, which means he needs to be treated as mutant (allergic) during his lifetime, it’s a relatively inexpensive test, around $60-70. I’m glad I did it. What about the danger to dogs of eating composted horse manure? One study on the effects of ivermectin in the environment found that loss of ivermectin residues from an Iowa clay loam soil ranges from 1 to 2 weeks in summer temperatures and up to 52 weeks in winter temperatures. Composting involves heat, so after a couple weeks, it will be less toxic than fresher manure. Chris Bern, DVM explains it this way: The half-life of ivermectin in horse and cow feces has been measured at as low as 11 hours and as long as 9 days. That means that it can take up to 9 days for half of the ivermectin to become inactivated, then up to another 9 days for half of the remaining amount, and so on. Realistically you can have measurable ivermectin in the manure for 1-2 weeks. My 10 year old boxer has eaten horse poop his entire life, is it possible he’s immune to the side effects of ivermectin that may be in the manure? If anything, I’d say he is lucky. Some dogs are genetically hypersensitive to the medication. In these dogs, ivermectin can pass directly to the brain and be toxic or even lethal. I am so sorry for your loss. I think once you know this about the wormer, it makes sense. But beforehand, who would have thought about it. Big hugs to you. I found this information to be extremely useful as I have to German Shepherds and 3 large horses. The dogs love to eat be fresh horse manure why do I know this because they usually come in the house and breathe in my face and I know automatically other times I have seen them pick it up I did not know that the wormer we give the horses was a concern it will be cleaned up as soon as they go for several days. Thank you I appreciate all the feedback worried about my dogs. I love natural solutions. I often find they don’t work as well, so then there’s the juggling, 6 of one half dz of other. Would love to hear more about Natural dewormers. Probably one of the best is food grade diatomaceous earth added regularly to a pet’s food. My Neighborhood had a party with horse and pony rides nice cute idea. But when I discovered horse feces in my garden I became concerned. I just had one of my cats put down and cremated three days before for a respiratory infection according to vet. The ER VET said it was something more then this respiratory infection. I have a autoimmune conditions and breathing and GI problemsolving. I asked them to remove it they were upset and angry. I told them they should of asked first.Then I Google horse feces sure enough especially the fresh stuff is toxic for various reasons.I live on a cail due sack where there are dogs and small children and me the sick women. They should of asked. I worm my alpacas monthly with ivermectin injectible. Is this a problem for dogs with eating alpaca manure? Absolutely. The dosage for an alpaca is much greater than the dosage of ivermectin for a dog. If you have dogs that are at risk for ivermectic at all, this can be very poisonous to them. An overdose could extend this list. New neighbors have two horses a couple of my dogs I’ve seen eating horse poop. My one dog which is half golden retriever has started itching and chewing a lot today. He has some itching allergies usually in winter and has been fine until today, now the itching has come on bad. Do you think the horse poop may have triggered this and I should take him to the vet. Never heard of this before and not sure what to do. Allergies can be triggered by many things. If it is a result of eating the horse poop, it could be that your dog has an allergy to something in the feed the horses are being fed. 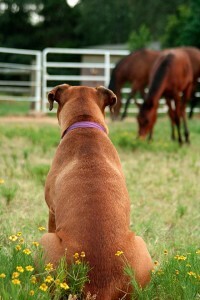 Often, horses are fed grains and grains are often a source of allergies in dogs. Have you checked to be sure your dog has not picked up fleas? That would be another source of itching. Another warning about your dogs eating horse manure… horses are generally wormed with ivermectin paste. The quantity used to treat a horse is somewhere in the range of 25-30 times the dosage for a medium to large dog. This is enough to cause ivermectin poisoning and even death to a dog. Bottom line is that eating horse poop is not a good thing for dogs, no matter how good they dogs say they taste. Why us commercial dewormers? My family has been using Diatomaceous Earth forever as a natural parasite control. Wormwood is also a great option. You shouldn’t have to risk any dog’s life. My dog gotten severly sick in a few weeks took her to Dr. says not much she can do, had enlarged liver,severe dehydrated, lost a lot of weight, diabetic in a short time, A friend read on this and gave her a wormer she seems to slowly come around but still waiting and watching, My other little dogs didn’t seem to have any problems so thanks for this info. Wish I knew more about this and what else to do, vets didn’t seem to even know about this. My dog has just recovered from an incident of moxidectin poisening (Quest horse dewormer) that she acquired from eating the feces of recently wormed horses. As a horse owner, I’m wondering why the package insert from these products do not list the risk of contaminated horse manure? It only states that exposure to the product can cause adverse effects not that it can be transmitted through the horse manure. My vet says that the manure can be toxic for up to 2 weeks post worming. If I had known we would have disposed of the manure more appropriately and have kept the dogs away. Our vet gives prescription worming to all our horses and other boarders where we keep our horses at the same time, so we can watch the dogs. With so many horses, and many on the trails with dogs, it is not always easy to keep dogs out of the manure. Thank you for the warning.